Massachusetts now mandates filing Forms 1099-K with the department of revenue when the gross amount paid in settlement in a calendar year is $600 or greater. Third party settlement organizations, TPSOs and other Massachusetts filers can use our 1099 software to comply with these new Mass 1099-K reporting requirements. 1.New reporting requirements are effective beginning with Forms 1099-K filed for 2017 calendar year. 2.Forms 1099-K filed for 2017 calendar year must be provided to payees by January 31, 2018 and must be filed with Mass DOR by February 28 or March 31 if filed electronically. 4.The reporting threshold is $600. 5.Where a filer has a Massachusetts Form 1099-K reporting obligation but is not required to file Form 1099-K with the IRS, the filer may file with the Department using IRS Form 1099-K.
7.The website to upload 1099-Ks to Mass DOR is MassTaxConnect (MTC). Create 2014 printable 1099-MISC forms in Adobe PDF format to report miscellaneous income, 1099 employee compensation and rents to the IRS during 2015 tax season. The resulting PDF files can be printed on Windows computers, Apple Macs, tablets and even smart phones that support documents in the portable document format (PDF). 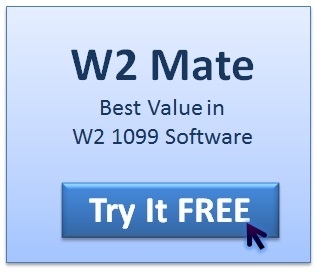 1- Open W2 Mate Software by clicking the icon on the desktop. 2- Create one or more recipients by navigating to the “1099/1098 Recipients” screen. 3- Fill in the Amounts for each recipient such as non-employee compensation, rents, royalties and so on. 4- Review the information for your recipients. You can also export all 1099-MISC forms to Excel where you can review your data in a tabular format. 5- Under 1099 Forms screen, click the “Create PDF 1099s” button. Specify the folder where you want to create the PDF 1099-MISC forms and the contractors / 1099 employees you want to create the forms for. 6- Now W2 Mate will create 2014 1099-MISC forms in PDF format that are ready to be sent to the recipients. 7- Use your email client or any other electronic communication means to send the PDF forms to your recipients. 8- Once the recipient receives the form(s) they can be opened and printed using the free Adobe Reader. 9- Click here for a sample 2014 1099-MISC PDF form created using W2 Mate software. To learn more about W2 Mate capabilities, please click here . If you read form 1099-MISC instructions for “Box 1. Rents”, there is a paragraph that states “See Regulations section 1.6041-1(e)(5), Example 5.”. We have been getting inquiries from some of our 1099 software users who can’t locate the section referred to by this paragraph. We have been getting emails and phone calls from our customers asking about the calculation of Form 1096 Box 5 (Total amount reported with this Form 1096) when used to report 1099-B (Barter) forms. Unfortunately there is an error in the form 1096 instructions from the IRS and we can still see the error with the latest copy downloaded today (Friday November 8 2013). The 2013 1096 form instructions (page 2 of the form) incorrectly instruct filers to enter the total amount from 1099-B boxes 1d and 14 in Box 5 of the Form 1096. The correct boxes are 1099-B 2a and 7. Please note that boxes 1d and 14 are not used to report money amounts, so they can’t be summed in the first place. Please also note that the IRS was in the process of introducing major changes to form 1099-B for 2013, but they ended-up using the same form for 2012 with minor changes. Form 1096 instruction most probably refer to boxes that were expected to be part of the new 1099-B form, which was never released. This error in form 1096 instructions applies to paper copies and does not affect users filing 1099s electronically. You can contact the IRS at the information returns hotline 1-866-455-7438 if you have any questions about form 1096 instructions.